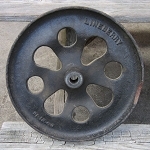 Side bracket for Lineberry center axle. Axle assembly with side wheels and connecting brackets. New old stock fixed caster wheels. New old stock - steel and cast iron caster wheels. As new hardware, with age, but no use. Four holes to attach to whatever project your heart desires!